Consumers vote with their dollars at every purchase. When you buy locally-grown organic produce at the Co-op, or from the farmers directly at the Co-op’s Tuesday Growers’ Market, you are supporting the families in this region who grow good food. There is another way to show that support for local growers – by joining a CSA (community supported agriculture). 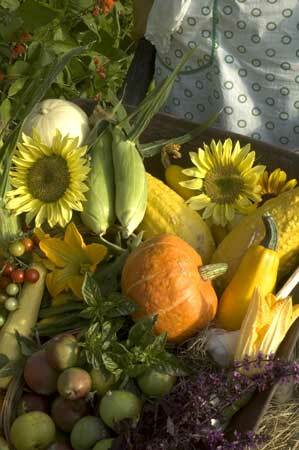 Growers offer a wide range of CSA programs, but they all have a common element. Consumers partner with growers by providing money at the beginning of the season (when growers need it to get started) and then receiving produce in return all season long. CSA programs are popular, which shows the high level of interest in this region in locally-produced fresh organic food. Here are some examples of CSA’s available here for the 2007 season. Bunzel Organics is seeking a few CSA members this year. The cost will be $80/month. The season will be from May 8 through October 23, 2007. Participants will receive a box of produce distributed each Tuesday at the Co-op Growers Market. A complete list of produce expected to be grown by month will be available. For more information, contact Ken or Betta at 208-285-3656 or kbunzel@genesee-id.com. MaryJanesFarm now offers a u-pick membership organization, called MaryJanesFarm Country Club. This unique CSA provides members with access to the greenhouses, fields, orchard and chicken coop at the farm, located 8 miles southeast of Moscow, which is the home of organic pioneer MaryJane Butters. Members are invited to visit the farm during daylight hours, any day of the week, to pick their own farm produce once they’ve attended a training session at the farm. Members pay an annual fee of $100 to join, and also pay for what they pick at a self-serve station at the farm. Members are also invited to bring out-of-town visitors and relax at the farm with a picnic lunch, or a snooze in the hammock, gather a bouquet of flowers, or a visit with the farm animals that are a delight for children to experience. For more information, call 208-882-6819 or see the website, www.maryjanesfarm.org. Elizabeth Taylor of rural St. Maries (about 50 miles north of Moscow) has been selling her organic vegetables at the Farmer’s Market and at the Co-op for many years, and this year is hoping to set up a CSA program. Participants would pick up their boxes at the Farmers’ Market from June through October. She has not yet established a cost. Contact Elizabeth by mail at 34713 Highway 6, St. Maries, Idaho 83861. The WSU Organic Farm has 100 members in their CSA, and a waiting list. They deliver member boxes at the Co-op Growers’ Market on Tuesdays. Half-shares cost $325 and full shares cost $525. Farm manager Brad Jaeckel will accept more people for the waiting list. Contact him by email at jaeckel@wsu.edu. The Soil Stewards (a UI student organization focusing on sustainable agriculture) also has a waiting list for their 15-week season (July through October). They sell shares for $225 (2 person size) or $300 (family size) and offer a work-for-shares option. Participants pick up their boxes on the UI campus. For more information, call the UI office at 885-7499. Affinity Farms of Moscow has a CSA program that is so popular that they are no longer accepting people for their waiting list.